While the vast majority of the Skrull population occupies themselves with a full-scale invasion of the Earth, Hercules is discretely taking the fight to a different level. 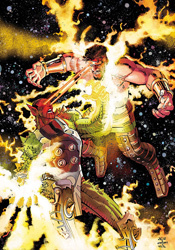 He's gathered a ragtag crew of immortals, Gods and cosmic entities and shifted his focus from defense to a surprise offense – leading a gutsy assault on the realm of the Skrull gods. It's been a long, brutal road, but in this month's concluding chapter, they've finally reached their goal. The religious leaders of the Skrull pantheon lie battle-ready in their path, and suddenly these guys look a lot tougher… and angrier… than Herc and his God Squad had anticipated. Greg Pak and Fred Van Lente have done fine work here, draping their storytelling in a steep, spiritual lore without getting carried away with long-winded Biblical dialog. If you've been waiting to discover who the Skrulls were talking about when they said, routinely, "He loves you," then you might be surprised to hear that the answer is here, rather than within last week's Secret Invasion #5. And while that entity's identity is left somewhat murky this month, it's at least nice to have some answers. While Pak and Van Lente have a firm grasp of the kind of fervor this character seems to draw out of his followers, a not-so-subtle allusion to nearly every form of modern religion, I wasn't impressed by the blunt solution they present to this situation. How do you defeat an endless army of shape-shifting religious zealots, bent on the eradication of your species at all costs? Why, you gather a few of Earth's least-known deities, travel to Skrull heaven and get into a fistfight with the man in charge. Who knew it could be so easy? This looks a lot more like an issue of Spawn from ten years ago than it does a modern series from Marvel. I don't necessarily mean that as a bad thing, because McFarlane's green-eyed devil has enjoyed some fine visual moments over the years, but it's a bit outside the boundaries of the publisher's typical illustrative style. Rafa Sandoval's work contains about as many lines as I can stand on any given page, but retains a certain charm all the same. His renditions of Hercules and Amadeus Cho, the book's dueling leads, are distinct and vibrant, and when he really needs to stand up and deliver a crisp, impressive splash page, he cashes in. When he's on point, Sandoval is a real talent, but troubles with consistency are ultimately his downfall. He can't decide if he wants to be Travis Charest or Chris Bachalo, often alternating between styles three or four times in a single page, and that's not going to fly for very long. There's a lot of pomp and circumstance in this issue, but I found it to be ultimately unsatisfying. The way we reach the arc's climax is happenstance and coincidental, which leads me to wonder why we needed three issues to set it up first. Isn't the point of a lengthy story arc to lay sufficient groundwork and back-story so that the final chapter can put it all to use effectively? Why was the tide-turning weapon found randomly on the ground in the middle of this issue, immediately put to use and then forgotten? Incredible Hercules is well on its way to becoming a quality series, but this tie-in wasn't a step in the right direction. Flip through it to enjoy the sporadic bright spots, and cross your fingers that next month's return business as usual also signals a return to form.